I usually do all of the cookie baking in our house. Not because Josh never offers to bake cookies, but I usually don’t let him:) The controlling side of me comes out when cookies are involved. If he starts to bake cookies, I usually run into the kitchen and take over. I can’t help myself. I LOVE baking cookies. Josh never gets upset, he just hangouts in the kitchen with me and eats my cookie dough. I try to smack his hands out of the bowl, but he is sneaky! He always manages to eat a few big fingerfuls of cookie dough. Josh loves cookie dough and I love cookies. These Chocolate Chip Cookie Dough Sandwich Cookies are the best of both worlds. Two homemade chocolate chip cookies are stuffed with chocolate chip cookie dough. Genius! We both get our cookie fix with these delectable sandwich cookies. This recipe comes from Lindsay Landis’s new book, The Cookie Dough Lover’s Cookbook. Cookie dough fans-you need this book in your life. Trust me, it’s a winner! The Cookie Dough Lover’s Cookbook is filled with with recipes using eggless raw cookie dough in candy, cakes, pies, brownies, ice cream and more. Lindsay is a cookie dough genius! There are so many unique and creative recipes in the book. I can’t wait to try them all! So back to the Chocolate Chip Cookie Dough Sandwich Cookies-they are awesome! Cookie and cookie dough lovers will both be happy with these sandwich cookies. We served them at a party and they were a huge hit! Adults and kids were all raving about the cookie sandwiches. Experience a little chocolate chip cookie heaven and make these Chocolate Chip Cookie Dough Sandwich Cookies! Two chocolate chip cookies are stuffed with eggless chocolate chip cookie dough. Cookie and cookie dough lovers will go crazy for these sandwich cookies. 1. In a large mixing bowl, beat together butter and sugars until no lumps remain, 1-2 minutes. Beat in eggs and vanilla extract, scraping the sides of the bowl to make sure all of the ingredients are incorporated. Add flour, baking soda, salt, and mix until smooth. Stir in mini chocolate chips. Cover and refrigerate dough for at least 1 hour or overnight. 2. Preheat oven to 350 degrees F. Roll chilled dough into smooth, tablespoon-size balls, about 1 inch in diameter. Flatten balls slightly into 3/4-inch disks. Place disks about 2 inches apart on parchment or Silpat lined baking sheets. Bake for 9-11 minutes, or until cookie edges are slightly golden brown. Let cookies cool on baking sheet for about 5 minutes. Transfer to a wire rack and cool completely. 3. To prepare the cookie dough filling, beat together butter and brown sugar in a large bowl with an electric mixer on medium speed until light and fluffy, about 2-3 minutes. Mix in flour, powdered sugar, and salt on low speed until incorporated. Slowly add heavy cream and vanilla extract and beat until fluffy, about 2 minutes. Stir in mini chocolate chips. 4. To assemble, sandwich 1 heaping tablespoon of filling between two cookies. Press cookies lightly until filling spreads to the edges. Repeat with remaining cookies. Note: Sandwiches can be stored refrigerated in an airtight container, for up to 3 days. Let them sit at room temperature for 30 minutes before serving. Definitely cookie-dough! Whenever we bake cookies I eat more of the dough than the baked cookie. OMG, those look terrific! What an awesome treat. That’s a tough one. I’ve been a cookie dough lover since I was a child but I’m beginning to really love baked cookies just as much. What a quandry! Hands down, raw cookie dough. I have to stop myself from eating the whole bowl so there will be some left to bake! I guess it depends on where in the cooking making process you ask me. If you ask me during the dough stage, then I would say cookie dough. But right after a chocolate chip cookie has come out of the oven and they are all warm and gooey, well, then I would say the cookie. What came first, the chicken or the egg? Since I am pregnant, baked cookies better! Straight up cookie dough for sure! I love cookie dough! It’s my favorite! Oh I think I liked the baked version better. Tough one though! Definitely the cookies… warm out of the oven! Cookie dough all the way! Cookie dough without a doubt!!! wow! these look amazing! i am a lover of both so these cookies look perfect for me. but if i had to choose i guess i’d have to pick baked chocolate chip cookies. I love cookie dough better!!!! I have to say that a warm, oozy, fresh baked cookie with a cold glass of milk can’t be beat! So, make mine baked, please! I love both, but would pick a warm cookie straight from the oven first!! Is that question even possible to answer?! I’ll say baked cookies but must add that half the cookie dough is usually gone before they reach their finished state! Both! I love the baked cookies as much as the cookie dough. I’m a baked cookie girl myself! Baked – but there’s something naughty about eating the dough. When you can sneak it, you gotta just go for it! Yum! I like them both!! I think my favorite though is slightly underbaked cookies. That way you have the doughy centers, and the baked outsides. YUM! Cookie Dough! Tastes delicious and you don’t have to wait as long. I LOVE raw cookie dough. I enjoy baking cookies because I can eat half the dough while the cookies bake. Cookie dough of course. Christmas of my 7th grade year I use to sneak down to the basement frige and snack on the choco chip cookie dough. Two fingers full per trip. Then I would wait until my mom was out of the house and I would have to make another batch. I had to replace the batch 4 times that Christmas. I was obsessed. But it was oh so yummy. Always always ALWAYS prefer the cookie dough!!! raw cookie dough is the BEST! Love your blog! Definitely COOKIE DOUGH 🙂 The best cookies are the ones that are still fabulously doughy, even after cooking! Cookie dough is my favorite! I’ll usually freeze some dough with the intention of baking it later but that never happens, I always end up eating it! Oh my gosh, this cookbook looks awesome! I am totally the dough queen around here, not just with cookies but I love eating any type of dough/batter — biscuits, pancakes, muffins, etc. Raw is usually better than baked. I actually have a small tupperware full of frozen cookie dough balls in my freezer right now that I stashed away the last time I made cookies. I have them hidden in back so my husband doesn’t find them! I love baked cookies, but I also enjoy me some cookie dough anytime!!! I like baked cookies, warm and gooey, much more comforting!!! It’s a toss up, but I will have to say, cookies! I loved baked cookies but in the right mood cookie dough is just what I need! 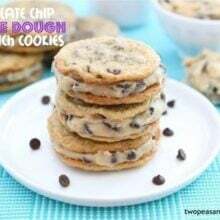 I consider myself a cookie dough lover, I think I MUST make these! Cookie dough! Or underbaked cookies fresh from the oven. I’ve always LOVED cookie dough. Love the book!!! Cookie dough hands down- because it’s wonderful, and when you’ve had enough it becomes a cookie! I like cookie dough better. Whenever I make cookies, I eat so much of the dough that I don’t even want cookies anymore by the time they’re baked! I’m a baked cookie lover. I’ve always been a little squeamish to eat more than just a lick of batter of anything with eggs in it. However, I am seeing a lot of eggless, meant to be eaten raw, dough recipes lately. I may have to experiment. Nothing beats a warm fresh out the oven cookie. Duh. Cookie dough are totally better! 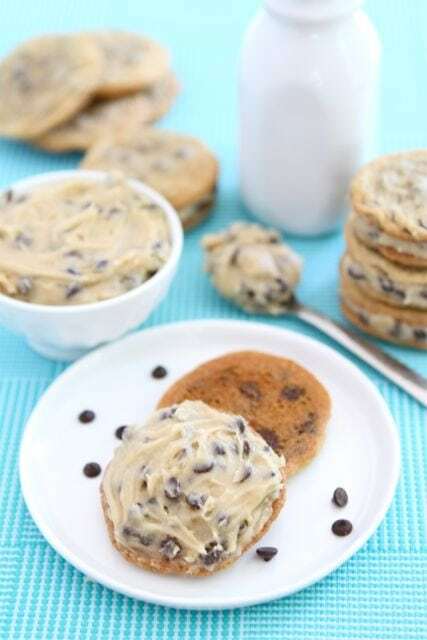 Cookie dough cookies, ice cream… You name it and I’ll love it! I like baked cookies better. Not so much the crunchy cookies, but the soft chewy cookies. Yum! cookie dough is my preference! Cookie dough is the best! I love cookie dough! I don’t bake because I will eat all the cookie dough before I can make the cookies. I love soft cookies — baked not cookie dough. Which do I like better? Who says I have to choose?! 🙂 It’s like picking your favorite child!!! I love cookie dough ever since i was a little kid–being a rascal, i remember stealing the dough when one of my older sisters would put it on top of the fridge i some how got up there. Now as a mom of three my kids and husband go crazy over it as well, oh the little things in life that bring such joy :)!! It sort of depends for me…I definetely like chocolate chip cookie dough more than the cookies, unless its my go-to recipe. But, I’m not a fan of oatmeal cookie dough. In that case, cookies surpass dough. Definitely cookie dough – when I was a teen I would make batches of cookie dough when my parents were gone and just keep it in the fridge and munch away…….still love the dough and my kids do too! I love baked cookies the best….especially when they are right out of the oven with a cold glass of milk…mmmmmm good! I think it depends on which cookie I am making, usually I like the finished product better, but chocolate chip cookies are my exception – I prefer the dough! Cookie dough! Mmm… Though warm cookies fresh out of the oven are also really tasty. I do love cookie dough and usually end up eating my fair share ;), but you can’t beat the smell of warm cookies baking in the oven! I actually prefer baked cookies, but absolutely love both! Baked and warm cookies the best! I can’t wait to try this recipe! umm dough!!! why other baking?! Oh man that sounds delicious!!! I don’t think I can pick which is my favorite! It totally depends on my mood. Cookie dough is one of the most delicious things ever, but sometimes you need that fresh-from-the-oven gooey-ness of a cookie. If I could have a little melted chocolate in my cookie dough, I’d be in heaven! I’m definitely a baked cookie gal…but they have to be gooey, almost undercooked. 😀 These look fantastic! Both! How you can you not try the cookie dough when you’re making cookies?! And then how can you resist a hot cookie out of the oven. Both I say!! no competition – straight cookie dough. I love cookie dough 🙂 Yummy. I recently made cupcakes with a cookie dough filling and they were delicious! I like baked cookies the best! But I recently made chocolate chip cookie dough cupcakes and they were pretty amazing!! COOKIE DOUGH!!!! When I was younger, my brother and I would always sneak the dough from the fridge. My mother started counting how many dough squares (store-bought) were left so she could catch us! Baked cookies all the way…especially warm, straight out of the oven! I must be weird.. I like the cookies baked best! I’m a cookie dough fan. I usually eat some much dough while baking cookies that by the time they’re done, I’ve had my cookie fix! Its only 9 am and this is making my mouth water….love warm baked cookies but this is even better! Cookie dough for sure! I will make cookies as a pretense to just making the dough. Soooooo good! Oh, I really must have a copy of this new book! I LOVE both the dough and undercooked cookies. I’m passionate about baking cookies and bake a batch almost every day. I totally go for cookie dough….unless the cookie is about 30 seconds out of the oven and not quite baked all the way through. YUM! Gotta have BAKED cookies. The way the house smells. Warm from the oven with a cold glass of milk. PARADISE!!!! Cookie dough!! We eat so much of it before it bakes that I’m never sure how many cookies my recipes are supposed to make! There is really no need to debate…cookie dough is WAY better! Definitely like cookies better (as long as they are soft and chewy) Yummmm! I like cookie dough better, but can eat more if it is baked! Cooikie dough for sure! There is a place not too far from my house that sells raw cookie dought by the scoopful – and it is my favorite decadent treat for sure. perhaps this is why I need to lose 20 lbs? ah – who cares – delicious! I love them both so much… who can really choose! But if I have to choose, probably cookie dough because who doesn’t like instant gratification! Frighteningly I used to eat the refridgerated cookie dough right outta the tube…in quantity. This looks like a healthy and safe alternative. Will make today – perfect for an after school snack with some sliced apples or strawberries. Which do I like better? Don’t make me choose! But under pressure, I think I’d pick cookies! I like baked cookie dough, but I love chocolate chip cookie dough ice cream best! I like baked cookies better. Especially when the center is gooey and the edges are crispy! I like baked cookies better! My hunny and step daughter like the cookie dough! That’s a tough one ! Before they are baked, the dough is the best. After they are baked I love them too ! I am so confused !! I actually am a bigger fan of the finished cookies than of the dough! But I always taste the dough before baking because if the cookie dough is good then the cookies will be good! Uhh… yes? I think it depends on the cookie recipe. Slightly underbaked cookies provide the best of both worlds! I’m with Josh, I’m all about the cookie dough! Though I wouldn’t turn down one of your homemade cookies either! Am I allowed to say both? I love both cookie dough and fresh baked still warm from the oven chocolate chip cookies. That is such a hard decision but I will have to go with cookie dough. Of course the cookies are delicious also but I would rather eat the dough, it is just that you usually aren’t suppose to eat the dough. This is a great recipe for both worlds. Wow, those look amazing! Thanks for the book giveaway! I like cookie dough better!! Okay.. I guess a warm cookie right out of the oven does it for me. I like baked cookies, but anythihng that’s cookie dough flavored is good by me!!! Do I have to choose? I love both! Mmmmmsounds yummy! :) who doesn’t love cookie dough?! Cookie dough. Confession time…Sometimes I say I am going to make cookies but it is just a ploy for the dough. It’s so hard because I love them both in different ways buuut….I mean…c’mon. Cookie dough!!! Personally, I like baked cookies better. But my hubby is a cookie dough fanatic! Hard to make the choice but I think I like the baked cookies better. I can’t decide! I like to sneak some dough while I am scooping it out onto the cookie sheet…but I love a warm, gooey chocolate chip cookie. I even love the ones with only one or two chips in them because the cookie part is so yummy. I used dark brown sugar instead of light for my last batch and OMG were they good! Anyway, my son loves everything cookie dough – ice cream, ice cream blizzards, cookies, cakes etc. He has requested a chocolate fudge cake/cookie dough, cheesecake combo for his birthday cake this year!! It’s hard to choose, but probably warm cookies right out of the oven! Thanks for this chance to win!! I think I prefer my cookie dough uncooked… sandwiched between two baked cookies. Now that’s just a great idea. I prefer my cookie dough baked! As a teen ager, I was crazy over uncooked choc chip cookie dough. I even babysat for a couple who always had a bowl of this in their frig for the husband to snack on…I cannot say “no” to soft, doughy cookies to this day. I like eating raw cookie dough as long as it does not have eggs. This recipe really does have the bedt of two worlds!! Must try! I LOVE cookie dough the best, but baked cookies rock too! I like baked cookies best. how can you even pick one?? that’s why this recipe is so great!!! I love half-baked cookies! The cookie and the warm cookie dough? Best of both worlds! I will eat it either way I can get it. I go back and forth on that one! While I am eating each one, I am liking that one best! Same with cheesecake and cheesecake batter! I’m going to hedge and say that enjoying both is part of the same glorious process. If pressed, I guess I’ll go with baked cookies, because I like the golden brown edge & molten chocolate. Cookie dough for me! Although sandwiching it between to fresh cookies sounds like absolute perfection! those look AMAZING! I love the warm baked cookies best! Cookies but boy oh boy is dough a very close second. Baked cookies, but I never skip a taste of the dough while I’m making them! Unfortunately, I like both. Can’t seem to keep my fingers/spoons out of the cookie dough, though. It just isn’t cookie baking if you don’t sample some of the dough! My youngest son is going to LOVE these cookies…he’s a real big chocolate chip cookie lover, and he REALLY loves cookie dough!! I’m not too picky as long as it has the word ‘cookie’ in it. I love baked cookies – but these are the best of both worlds! I can’t help but eat cookie dough along the whole process of cookie making, but I still love the actual baked cookie the very very best! That is a hard one – but I think baked cookies are better. tough choice! i think i have to go with cookie dough, though! i can pass up cookies sometimes but a big bowl of dough is irresistible! I’d probably have to say cookie dough. There’s just something so yummy about it!!! Baked cookies – straight from the oven! These look amazing!! I LOVE cookie dough! I even like my cookies on the undercooked side so they are still rather dough-y! 🙂 This book looks like it was made for me!! Me – Dough! My kids – Dough! My husband – Cookies. cookie dough! though i love them both. Baked cookies because I love dipping them in a big glass of cold milk. Cookie dough. Hands down! I could eat a whole bowl! Depends on the cookie…..I love chocolate chip cookie dough but usually not other types. I only really enjoy cookies when they are warm out of the oven. So, both? Haha. I have to say I love COOKIE DOUGH 🙂 Yum!!! I thought I was the only one…..I love cookie dough better than baked cookies! Half-baked cookies! That way you get the crispy outside edges and the gooey warm center! Both are delicious but with baked cookies, you get that wonderful sweet aroma in your house! the dough is the best! Fresh out of the oven with a cold glass of milk! I have to say I am a big fan of cookie dough. I would say I like the dough better than ALMOST all cookies I would love to win this book! I have to say I like baked cookies better! I know, I know… blasphemy. 😉 But I just love how delicious they are right out of the oven! Mmmm. Warm cookies straight out of the oven while they are still gooey are the best…..with a glass of milk of course! Cookies! The dough is good too, but I prefer it baked. DOUGH!! Especially in ice cream! It’s a toss up for me, I like both! That book would be awesome since I’m prego and can’t sample raw cookie dough right now. I always think the cookie dough is better than the actual cookie. I NEED this book! I really really love cookie dough in the summer, or anytime it’s just too warm out. But nothing beats cooked cookie down when it is chilly outside!! Definitely cookie dough! I usually eat so much of the dough that I don’t even want the cookies after I bake them! Well, maybe for a day or so, then I resume my cookie monster status. I WOULD RATHER EAT THE DOUGH AND HAVE! Definitely cookie dough!! I have eaten so much before the cookies are baked that my sweet tooth is over satisfied once the cookies are out of the oven! Slightly under-baked and fresh out of the oven! I love the warm, ooey-gooey, mess!! Eating cooking dough is the reason I bake cookies! This is a tough question. I am going to have to say cookie dough, since I will often decide which cookie recipe to bake solely based on how good the dough will taste. I’ll take a bite or two of the dough but I like baked cookies better. Honestly, I liked baked cookies better! cookie dough for SURE! when i was little, my dad would buy us a tube of cookie dough from the store so we could go home and eat the entire thing in one sitting, just me and him! Wow, these look amazing! I like cookie dough, but love cookies more…warm gooey goodness with a glass of milk. Yum! You can’t get that feeling from cold cookie dough. I am torn. I love eating cookie dough- my favorite dough is chocolate chip. But I don’t know if that beats out a warm cookie. I go crazy for a warm cookie! all i can say is i have eaten more cookie dough than i will ever admit to. what is it about cookie dough? I can’t choose! I have to hold myself back from eating too much of both:)) That’s why today’s recipe will be perfect for me! definitely prefer raw cookie dough! DEF BAKED. I am not a fan of cookie dough at all. MMMMMMMM ANY COOKIE BAKED. DROOL. I WANT RIGHT NOW! Those look so yummy! I am definitely a cookie dough girl! Cookie dough for sure. Sometimes the cookies don’t even get baked because all the cookie dough gets eaten. I like the baked cookies right out of the oven best, but that doesn’t stop me from tasting the cookie dough too! Baked, so I can dunk them in milk! Cookies are good but I LOVE the cookie dough!!!! both. this is why I must try these cookies. Baked cookies that are a little doughy still. Oh these look so so sinful! I would much rather eat the dough! Those tubs of dough that you’re supposed to bake into cookies – never make it to the oven at my house! I would love a copy of this cookbook! I’m not really a cookie fan (blasphemy, I know!). But I could eat cookie dough all day – and most of the night. I love the dough for a treat, but melt-in-your-mouth warm cookies are hard to top. Def love cookie dough the best! I like baked cookies better but I do like stealing a few bites of the dough off the spoon before washing. 🙂 Book looks exciting! cookie dough – if it is chocolate chip or similar…if it is molasses (my other fav), definitely the cookie as I love the crunch after adding the sugar! Depends on the mood and the outside temperature. During the winter, it is hard to beat a fresh baked cookie with a mug of hot chocolate…with whipped cream! Cookie Dough is where it is at! A few years back I probably would’ve said cookie dough, and not that I don’t love it now too, but I think overall nothing can beat a warm, straight-from-the-oven homemade cookie. That, you know, is soft enough to still taste something like the dough in the center anyway…. I LOVE nice chewy cookies! The dough’s great, but just not the same as a cookie with a big cup of hot coffee. I would say soft baked cookies are my preference. I find baking very relaxing. Cookie dough! Yum! But together, these will be awesome! I like baked cookie dough much better, unless it’s in ice cream. 🙂 thanks!!! Yumm yumm to cookie dough!!! It’s soft gooeyness is delightful. But the baked good is just as yummy right out the oven. I’d happily eat both–so this is the perfect recipe for me! Can’t wait to try it. My family are chocolate chip cookie dough nuts!! This would be a perfect addition for our family tastebuds! I like baked cookies better. I would much rather eat several spoonfuls of cookie dough than the baked cookies themselves! When I was little I would always make cookies with my friends during sleepovers and we would share bowls of dough before any baking happened! I’m a big fan of both, but baked cookies would be my favorite! Mmm thanks for sharing this recipe! Cookie dough is the best. Baked cookies especially the ones that have just come out of the oven and are still gooey. Yum! It depends on the cookie! I love peanut butter cookie dough the best. I prefer them baked but dough is a close second place! Thanks for the giveaway chance! I adore your site! It’s a toss up! I eat too much of both when I am baking cookies!! Personally I like cookies better but everyone else in my house seems to like the dough better…which is just as well as there are fewer cookies for me to eat!! Hot right out of the oven cookies! I love both, but I would say baked cookies win this battle slightly. I love raw cookie dough!!! I like both, but my favorite has to be warm, freshly baked cookies!! that’s a hard decision… but I think I like baked cookies just a little more than cookie dough! especially if they’re warm! 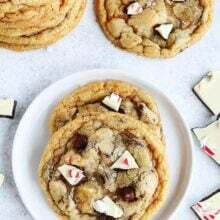 It would be almost impossible to choose between cookie dough and cookies, maybe a hot chocolate chip cookie thats still so soft in the middle its almost dough! I always end up eating more raw dough than actual cookies! It’s just too good! Cookie DOUGH is SO much better than baked cookies! Being able to shovel yumminess into your mouth with a spoon beats having to deal with crumbs all over the place… Plus, there’s no waiting for the cookies to bake and cool! Bonus!! Love cookie dough, but only in chocolate chip form. No other kind will do unless its a baked cookie!!! I’m a baked cookie kind of girl- but these look amazing!! I prefer cookies! I do like cookie dough but I usually prefer it in things like shakes or, in this case, in between cookies! Cookie dough all the way! So much so, made a “cookie dough” cake pop recipe. Yum!! Cookie dough…definitely! I’m a fiend. COOKIE DOUGH!!! Love your recipes! The dough is the best part! I prefer cookie dough! These look amazing! 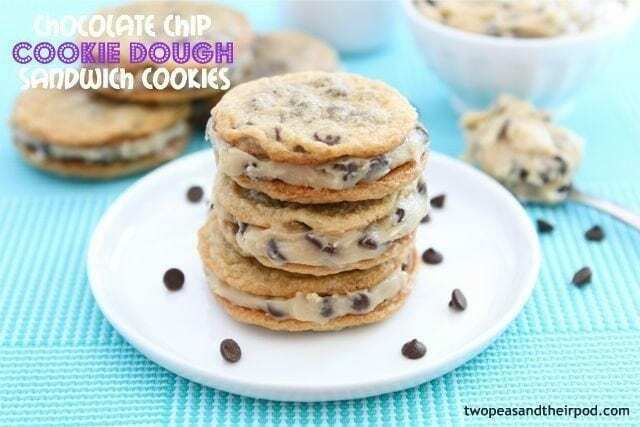 Cookie dough, cookie dough, cookie dough… These look amazing. I’ll have to make them soon. cookie dough! I could eat the whole bowl in one sitting! These look so good. I’m going to try these this weekend. Thanks for posting! I like under-baked cookies the best! I love both.. there’s nothing like warm baked cookies straight out of the oven.. I don’t like to cook them much so that they get kind of doughy… I adore sneaking for cookie dough.. hard to decide!! I would eat either and both cookies and dough! Wouldn’t anyone? Dough for sure! I just made chocolate chip cookies last night and we all ate some dough! Cookie DOUGH! Especially in ice cream! I will always love cookie dough more than baked cookies. Baked cookies are my fav – who can resist the warm ooey gooey chewiness?! These definitely sound like the best of both worlds. I love cookie dough but I probably love a still-warm just-out-of-the-oven cookie just as much. I like the dough but a warm baked cookie with a cup of iced coffee is hard to beat! Def prefer baked cookies better! Baked cookies are a lot better. I love the cookies the best! I actually prefer baked cookies. it’s a texture thing. It’s so hard to choose which I like better, but cookie dough seems much more sinful. My all time favorite treat is two cookies, fresh out of the oven, with raw cookie dough in the middle. I can’t wait to try these! Cookie Dough Cookie Dough Cookie Dough. Without a doubt! Can not wait to check out this book! I love both! Eating the cookie dough and then eating the fresh baked cookies is the best. I love them both, what’s not to love! Thanks for this recipe! I love cookie dough, but I like baked cookies better since they don’t give me a stomach ache. If I could learn to make eggless dough, it’d be the best of both worlds! Definitely love the baked cookie the best. I’m a ‘dunk it in milk’ kind of cookie lover! The crunchier the better most of the time. I definitely like baked cookies better. Thanks for the chance to win! I like cookie dough better! Though I have tried some eggless alternatives, I usually risk making regular cookie dough and then just dig in with a spoon. Come to think of it, I think I need to make some more today! I like my cookies baked–but my husband makes cookies just so he can eat the dough, so this book would be perfect for our house. Love, love, loooove cookie dough to cookies! Especially chocolate chip! I’ve also been known to whip up a box of brownies just so I could eat the batter! Deeelish! Mmmm, tough decision. I’m going with fresh baked cookies. I can’t wait to try this recipe!! Cookie dough all the way! I swear when I bake cookies, half of the dough ends up in my mouth instead of in the oven! COOKIE DOUGH RAW!!! I’ve always been told you’ll get sick by eating the cookie dough raw but so far I’ve been fine and I just love it! I love both but baked the most. I think I may be one of the few who would prefer a baked cookie, however straight from the oven so it’s really melty (is that a word?) in the middle!! I’ve had my eye on this book, I hope I win!! I’m an underdone cookie fanatic – I mean, I eat it out of the bowl while making, but somewhere between completely raw and very clearly cooked is where I am happiest! Yum I LOVE cookie dough!! I must say that cookie dough is my fave when it comes to chocolate chip cookies! Definitely Cookie dough especially Chocolate Chip! I also love my baked cookies gooey! You’ve hit me where it hurts! I love the cookie dough, but nothing is better than a warm chocolate chip cookie with a glass of cold milk. I love cookie dough but I have to say cookies straight from the oven are my favorite. Cookies, never got into eating cookie dough. I like the chewy/crunchy texture more. Cookie Dough all the way!!!!! i would eat both! but i think i do like the baked cookie better! but a lovely post! 🙂 your cookies look gorgeous! Cookie dough for sure! I love eating chocolate chip cookie dough ice-cream! They are both indescribably good, but I would probably have to go with baked cookies. I always, ALWAYS have a few bites of cookie dough …but at the end of the day, I like cooked cookies better! I’d love to be entered – you can never go wrong with a cookie or three!! And these cookies look insanely good. I think I need to bake them for the office as soon as possible! I love cookies dough. Who can’t resist taking a few bites before baking. After all, by the time they’re done the kids eat them before you! I love cookie dough. 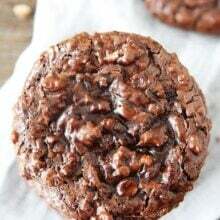 The baked cookie is good, but nothing beats choc. chip cookie dough. I like the cookie dough the best. I never thought about making it without eggs so you could eat it. Cookie dough, sometimes I make a batch and never bake a single cookie. I just keep the bowl in the fridge and eat the dough for days! Although I like the dough, nothing beats a warm chocolate chip cookie. These look amazing! I have to say as much as I like to get a little bite of cookie dough in, nothing beats a soft and warm baked cookie. I really like cookie dough, but nothing beats a just baked, gooey chocolate chip cookie. I am pregnant with my 4th and this time around, cookie dough is the ONE thing I cannot get enough of. I can always be found with a bowl of cookie dough in the fridge to counter the cravings. But the cookie? Eh…not so much. I love baked cookies, but ones that aren’t fully cooked and still soft in the middle. It’s the best of both worlds! I like cookie dough better. Maybe because I don’t have to wait for it! I prefer the cookie dough! Cookie dough is the bestest!! The dough, that is why I under cook my cookies. I guess that is the best of both! A bit cookie and a bit doughy! Cookie dough is truly addictive. As much as I loved baked cookes, the dough does me in every time. I can’t wait for this book. I think I’m going to stay on the fence for this one. Both are amazing! I love cookies!! I generally eat about ten cookies worth of dough while my husband hovers anxiously in the background dropping hints about there being enough left to actually make any cookies. I rarely eat them after they’re baked. They’re all for my husb. I ‘ve never tried raw cookie dough…I only eat them after they are baked. Cookie dough ’cause you don’t have to wait for it to bake!! I like baked cookies better (my husband actually makes them) but he also likes to eat cookie dough when he does so he would love these sandwiches! I love cookies and my husband prefers the dough;) perfect recipe for us too! Cookie dough…though freshly baked cookies right out of the oven are pretty yummy!! The cookie dough for sure! Sometimes even before you add the dry ingrediants…Butter, sugar, vanilla = YUM! I prefer baked cookies, but I’m going to try out this recipe. Yum! This is such a hard question!! Cookie dough, probably! My roommates back from my college days will verify how much I ate, just sitting on the couch, with a spoon. YES, embarrassing. I love cookie dough so much more than baked cookies! Unless the cookies are hot and barely baked and still taste like cookie dough. COOKIE DOUGH WINS! My kids wonder who ate all the cookies????? All of the uncooked dough doesn’t make it to the sheet. ooooohhhhhh, yum. I tend to eat more cookie dough then cookies so I guess that makes me a cookie dough lover! Cookie dough! I make cookies because I am craving the dough – and only cook them so I don’t eat all of the dough! I know – it’s bad! Baked cookies are the best! I love them in the middle, somewhere in between raw and cooked. My husband calls them medium rare! These look perfect for me! These look so good!! I like cookie dough and baked cookies equally! I love cookies, I really do, but the cookie dough is always at least 20% tastier. The ultimate cookie…A cookie within a cookie! Absolutely fabulous! Cookie dough for me. Sometimes I eat so much of it that I don’t even want the cookies when they are all done (well, maybe just a little taste). It’s a tie – I really can’t ever decide which one I like the best. While I’m making the cookies, it’s the dough. When they’re done baking, it’s the cookies! I love, love, love, love, LOVE raw cookie dough! When Lindsay announced on her blog that she had written this cookbook, I was over the moon excited (and still am!). I can hardly believe the release date is finally (almost) here!! Would love to win an extra copy (I obviously have one pre-ordered too though :)! I love baked cookies best, but cookie dough is still a delicious option! I like cookie dough better! Cookie dough all the way! Chocolate chip is my husband’s favorite. I made cookie bars last year for his birthday, and will make these this weekend for his birthday! They look amazing! It’s a tough choice! I love cookie dough, but eventually grow tired of it and want the baked cookies (if I’ve left enough dough for baking). My preference also changes with the type of cookie. I love sugar cookie dough but can (usually) leave (most of) the cookies alone. Any chocolate or chocolate chip dough is a huge temptation, but then so are the cookies. Must I really choose just one? I bake cookies just to eat the dough. So def. the dough! The dough by far! Yum!!! Thanks! Mmmmm….both are delightful, but there’s nothing like a good soft cookie…almost like dough!! Looks delicious! I love love love baked cookies 🙂 but I also love love love cookie dough. I love both but cookie dough is so much better than baked cookies especially in ice cream. I prefer baked cookies…but will snack on the cookie dough as I’m baking! It depends on the type of cookie for me. With chocolate chip and peanut butter cookies, I’d say the dough would win (just slightly) over the baked cookies. With other varieties, like sugar cookies, gingersnaps, and others, I prefer the baked version. I can’t wait to try this recipe! I love the cookie dough, I just can’t help myself. Yummy 🙂 these cookies look fantastic, I can’t wait to try them. I love cookie dough! But baked cookies are pretty good too. I love baked chocolate chip cookies, cooled a tiny bit, & eat like that or make a chocolate chip vanilla ice cream sandwich. Yum! We love cookie dough at our house. We usually make it and freeze it and then eat it as a treat or half-bake it with ice cream. Yum! I am obsessed with cookie dough! I am so excited about this book! Thanks for the chance to win! Baked cookies! Knowing there is raw eggs in the batter just freaks me out, even though I am perfectly healthy enough to eat it. Her cookbook looks great!! I have to say that I prefer the dough over the baked cookie. Can’t help myself. These sandwiches are definitely the best of both worlds! Cookie dough uncooked of course! I LOVE cookies, baked. 🙂 These are too good to be true! Great looking cookie! I definitely love the dough (or the batter) way more than the final baked goodie! I believe I like mine baked better… but eating bits of dough while making them is part of the fun! I <3 cookie dough better ! It definitely depends on my mood – sometimes I only eat the dough and give away the cookies! I love both but LOVE cookie dough even more! I can’t get enough! A hard choice…but I’ll go with baked cookies! tough one… i have to say baked cookies, just because i can eat more of them that way! It should be illegal to make someone choose which they like better! 😉 But if I had to choose I think I would have to say cookie dough, especially if it’s chocolate chip cookie dough!!! I love a freshly baked cookie out of the oven. Baked cookies–warm from the oven with really melty chocolate chips. Yum. I love them both. But I might have to go with cookie dough! I can’t help myself! I love cookie dough way more! Nothing’s better than warm cookies! baked cookies for sure, esp if they’re still warm from the oven. And I don’t always eat the egg-free version. Oh my. Just the right amount of sweet …. and salty …. and chocolate. It’s so good! 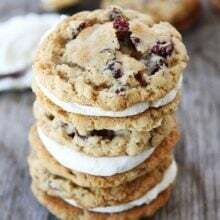 These cookies sandwiches look fabulous and I am dying to get my hands on this book! I eat baked cookies much more than dough! My husband usually can’t keep his hands out of the dough though! this is how i eat my cookies when i make them! i bake a batch and while the next batch is baking i dig into the warm cookies and put the dough in the middle! YUMMY!!! Oh gosh…what a difficult question! If I had to choose, I’d say baked cookies. Baked cookies but not overbaked so they are still gooey. Best of both worlds! I like slightly under-baked cookies, so that I get the best of both worlds, dough-y center and crispy edges! Warm baked cookies. Big, soft, and chewy. Fresh from the oven baked! My only curiosity about this cookie was “Would they put raw egg in the dough?” Of course they didn’t. But it needs walnuts to provide contrast to all of the sugar. My son will only eat chocolate chip oatmeal cookie dough…and I help! The dough, especially if it is nice and cold. Can’t resist the stuff! I love both. These cookies sound AWESOME! The dough, just not in ice cream. Fresh from the bowl! Warm baked cookies from the oven. Secretly I just love choc chip cookie dough. I use my own hens eggs, that way I don’t worry so much about the raw egg stuff. This is a very tough question! But I think I like cookies baked better, right out of the oven! Ohhh this looks like heaven, I like both !!! Cooked + baked !!! I do so enjoy the cookie dough, but I try (usually unsuccessfully) to restrain myself. I’m a cookie dough fiend myself and I’m reviewing this cookbook either this Friday or next! LOVE IT. I haven’t made these cookie sandwiches yet but you can bet I’m going to! Why should one choose? This is the beauty of making cookies from scratch. You get to have your cookie and eat it too. Ever since I learned how to bake I have loved getting to snack on the the dough as I bake off my cookies and then getting my fresh, warm gooey cookies after baking. These of course require a glass of milk, as anyone who has read If You Give a Mouse A cookie is aware. I love what you picked to make! I don’t need to be entered in the giveaway, I just had to comment on your cookies! I haven’t picked what to make out of this book yet, there are just too many amazing choices! But this was right up there towards the top – cookies and cookie dough together? It is like the best of both worlds. This is a toughie, but I have to go with the baked chocolate chip cookies. I need to have them straight outta the oven, warm and melty! YUM!!! I have definitely pinned this! 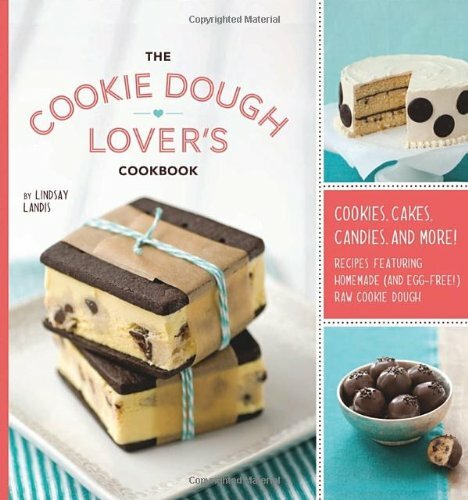 It would be super-exciting to win the cookie dough lover’s cookbook! Fingers crossed! I like cookie dough best- actually I LOVE it!!! Cookie dough! And I have learned that not all cookie dough is created equal. Just because I like the cookie doesn’t guarantee I’ll like the dough, and vice versa. Thanks for the giveaway. Either way I’m getting’ that book. It looks awesome! Of course the cookie dough is better! But I’m still a sucker for a good cookie with a crispy outside and chewy inside. Tough decision – made a whole lot easier – had a batch of choc chip cookies that were a but over baked for my taste – crumbled them up (not too fine) and added them to the next batch of dough – cookies were great but the dough was even better. cookie dough of course. I love the raw stuff but know it isn’t good for me. i want this book! I love Lindsay! OMG, the cookie dough!!!! Yummmm!!!! I really love both! I guess if I HAD to choose, I’d pick baked cookies, fresh out of the oven, with a blob of vanilla ice-cream on top. Love the hot/cold combination. I’m on Team Cookie Dough! I love cookie dough, but my husband freaks out about salmonella any time he sees me eating it. OMG this is such a hard questions to answer. Dough or Cookie. Cookie or Dough. Oh gosh…I’m going to say…Cookie! Sugar cookies are way better than just the dough – chocolate can go either way. Cookies JUST out of the oven. Still a tiny raw in the center, but hot and crisp. Cookie dough, if it does’t taste good raw, cooked? I like raw cookie dough…while my wife prefers baked cookies. I like the baked kind but my hubby can’t resist the unbaked! I loooooove raw cookie dough!! I’m allergic to eggs so I use an egg substitute (Ener-G) so I don’t even feel guilty sampling my raw dough ;). Tough one!But I think I’ll have to go with the dough! Raw is hands down the best! I love baked cookies right when they come out of the oven. I love cookie dough!! It’s the best part! I love both but I love the warm, melted, gooey chocolate chips more! Awesome. Thanks for sharing. I found this on Pinterest.com So happy I did. I’m a baker and even though I’m a Junior in High School, I’m already making a business out of it 🙂 I don’t know if that URL to my facebook will let you see the pictures… But those are my amateur cakes 🙂 It’s fun to bake and create new recipes and this one, if I do say so myself… Is awesome!!! I’ll take warm, doughy cookies straight from the oven! Thanks for the awesome give-away. Oh, this book looks perfect for me. I love cookie dough. I so love cookie dough the best!!! What a great cookbook idea! Oh, definitely the dough. Baking in my retreat, whereas what I bake ends up being treat for others. During the cookie-making process, many “quality control” checks mush be done…. So usually, by the time the cookies are actually done baking, I’ve had my fix already. Besides, the calories aren’t added until the cookies are in the oven — right????? OMG!! I am the baker in my house too! I love making cookies especially, but my family eats more cookie dough than baked cookies! These look awesome! I can’t wait to make them this week! Cookie dough all the way!! If it is chocolate chip cookies I definitely prefer cookie dough. But they are still delicious as cookies. I LOVE cookie dough! I usually sample so much cookie dough when I’m baking that I can’t even stomach a baked cookie. I’d love this cookbook to try the eggless recipe’s. What a genius book! Baked cookies are great but cold cookie dough is so good! Cookie dough for sure!! That is always the food I miss the most when I am pregnant! I would love some eggless cookie dough recipes (and my pregnant sis would too). So sad this is only open to US residents! These cookies look absolutely amazing! I love eating cookie dough! 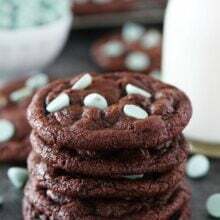 So much better than baked cookies, but I eat more baked cookies than raw dough because of the eggs, so I am so happy to see some eggless recipes! While I appreciate a good cookie, I LOVE cookie dough! Oh so yummy! Cookie dough, hands down. I even prefer my cookies to more on the “dough” end of the spectrum than “cookie”! Wow this cookbook looks dangerous! Definitely dough- especially with some oats in there. Cookie dough! I can walk right by cookies all the time but I’ll never let a smidge of dough sneak by. Baked cookies, especially when warm and gooey. It is a toss up for me. I really enjoy hot cookies straight out of the oven, but then a big blob of cookie dough right out of the freezer is pretty awesome too. The cookbook looks very interesting. My husband loves cookie dough, but I think nothing beats fresh warm cookies just out of the oven. mmmmm.. I’d still love to try the recipe book though! I’m not sure if a previous attempt at commenting went through or not.. darn work filters! I love dough when I make it, especially chocolate chip! ah cookies… you can always get a taste while making the cookies! I love cookies that have been baked to the point where the outside is crisp and the inside is just a bit chewy giving it the hint of the cookie dough state. I like baked cookies :). I honestly like baked cookies better. I don’t actually like chocolate chip cookies. But I do like the dough! I think I like baked cookies better…. When my boys would ask if they could have the beater, I would say no because it has raw eggs in it and I didn’t want them to get sick…. but really, it was because I wanted to eat them myself! Omg, OBVIOUSLY cookie dough! It’s amazing! I love cookie dough, but I really love baked cookies! Cookie Dough!!! Always cookie dough!! I think it might be a tie for me. I love cookie dough and I love a cookie right out of the oven. Your recipe makes is possible to have both…YAY! Love cookie dough!!! No idea why raw taste better!! I definitely LOVE the cookie dough more, but I wouldn’t turn down a cookie! And I definitely will be making these this weekend. Thank you for sharing! I can be very impatient, so I do eat the dough, but I really like the baked cookies better. It’s a tough call but I definitely love cookie dough a little more! Can’t wait to try the recipe!! Wow, what a hard choice! But in the end I would have to pick a perfectly baked chocolate chip cookie as they are my favorite! I like chocolate chip cookies…in any form. Raw dough, warm gooey goodness, off a spoon, out of a bakery bag, as an after dinner treat, and a morning wake up with tea. You can’t go wrong. I love both but I guess I’ll go with baked cookies, still warm and gooey from the oven! Both will work but baked cookies hit the spot! For chocolate chip cookies I love cookies (that are crispy and soft). I love that I can have both with this recipe! If I had to pick, I’d go for baked cookies warm from the oven!!! 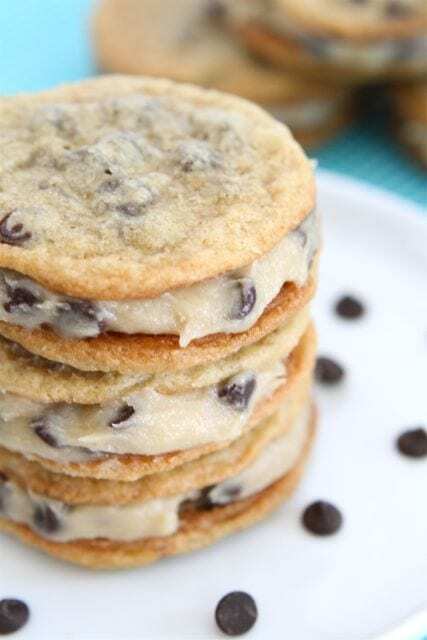 Definitely the cookies – so yummy with ice cream sandwiched in between!! I love a nibble of the cookie dough but prefer to eat the majority baked. These sandwich cookies look delish. Cookie dough. Sometimes I make cookies just for the dough. Cough dough – me and my daughter LOVE it! It’s a toss up – if the cookies are soft, gooey and chewy then I like those! Otherwise dough is the best! These would be really good FROZEN! They will be a new summer treat at my house! I’d say cookie dough as well, but fresh, warm, straight from the oven cookies are heaven too. Cookie dough vs. baked cookies?? That is one of the hardest “would you rather” questions, in my opinion. I always eat both, but I guess I’ll go with the baked cookie because I usually only eat a few cookies worth of dough whereas I can scarf many, many baked cookies. The final product wins. I definitely can’t decide. Cookie dough is so creamy, but cookies are so chewy. If I had to choose, I’d say dough. In fact, I am making cookie dough brownies tonight. Can’t wait. Definitely cookie dough! I agree with Ashley- the best cookies are the doughy ones! I LOVE me some cookie dough! Don’t get me wrong, I love baked cookies too, but the dough, is…..divine! I love all that is cookie dough! I’d love to have that book! These cookie dough sandwiches look amazing! I am definitely purchasing this cook book! Love Love LOVE Cookie Dough! I love cookie dough but I also loved baked cookies as well! I love chocolate chip cookie dough, But these are really the best of both worlds!!!! I rarely get to baking the cookies because I love to eat the cookie dough so much! Definitely cookie dough! Sonic has a new batter batter blast that has cookie dough and brownie batter! Can you say YUM!!! I do adore chocolate chip cookie dough…. but not nearly as much as a warm, gooey, baked chocolate chip cookie. cookie dough, without a doubt! I love cookie dough, but the little crunch of a cookie is hard to beat! While I love cookie dough, there’s something about the melted chocolate in chocolate chip cookies & eating them warm and gooey… I’d have to say cookies! I like cookie dough better. The book sounds great! I love the cookie dough! So so so good! Ilove both, but I guess I prefer baked. Though these are really the best of both worlds! I am firmly on the cookie side, but had 4 kids who loved both. It was always a race to get it into the oven before they ate them. I actually started making them while they were in school. They were so disappointed that I started saving some for them. If I was lucky enough to win I would give the book to my daughter who loves making cookies & eating cookie dough. Thanks for the chance. I love them both…but Im gonna have to go with cookie dough! Oh my…ALWAYS the raw cookie dough! I eveb risk the salmonella…do not tell anyone, okay?? This cookie-book is right up my ally! Lindsay’s book has been sitting on my desk tempting me now for awhile. I can’t wait to use it! The cookie dough is, by far, the best!!! LOVE cookie dough! I have memories of growing up during the summer, of my sisters and I munching on the cookie dough so much that there was not enough to make a batch of cookies! I like cookies, but usually don’t eat to many of them because I have eaten enough of the dough. I love all parts of cookie dough….I have to sample the butter and sugar, then after the eggs, vanilla, etc is added I usually taste it. Then after the flour has been added and again after the oatmeal, chips, etc., etc. Usually, I need a little taste with each cookie sheet that is fill. Looks like a great cookbook. Love your blog. Definitely raw cookie dough is the best!! I like not-quite-baked cookies – you get the best of both worlds – doughy and warm goodness! Warm cookies right out of the oven! Cookie dough for sure, there are times that I make a batch of cookie dough and between me and my two kids we don’t even get to baking cookies 🙂 Can’t wait to try these!! Definitely have to go with COOKIE DOUGH! That said, I find dough much easier to eat to excess as spoonfuls don’t make a full cookie until after 5 or 6 heaping tablespoons, right? Cookie dough all the way! Can’t get enough! I like the cookie better only because I know there are raw eggs in the batter! This is perfect!! No eggs! Yum – these look great! Can’t wait to try this recipe and take a look at this book! Hands down RAW cookie down is totally the best!!!! I love them both-but have to lean for a great warm cookie not quite cooked all the way through. Do I have to choose? Probably warm freshly baked cookies since there are more recipes I like baked rather than raw…buuut I absolutely love chocolate chip cookie dough! I have always loved cookie dough. This book sounds great! Oh.my.goodness. I am a total sucker for cookie dough. I think I could live off of it if my waste line and health wouldn’t be affected. This cookbook would be awesome! i like cookie dough better! 🙂 this recipe looks fantastic! its all about the cookie dough! Cookie dough. Hands down. Sometimes, it takes a lot of self control to carry on with the baking rather than sitting with a spoon and chowing down on dough! This book looks phenomenal! Honestly, it’s a draw for me. Nothing beats cookie dough – until the cookies come out of the oven ….. I love them both, but if I had to choose I would have to go with the cookie dough. love them, both the dough and the baked cookie! I just cant choose!!!! I really like cookie dough, but I love baked cookies, but only if they are fresh! That is definitely a hard choice, but I’ll have to go with baked cookies! My grandma makes THE best chocolate chip cookies….mmmm. Raw cookie dough is my hands-down favorite! Definitely cookie dough! My best friend, Sally & I have cookie dough dates, a tradition we started in college…..eating cookie dough & discussing boys in our dorm rooms. Now, we just discuss life: my husband & baby, her job & man troubles via phone. Keeps us connected & is super yummy! Cookies! Love when the exterior gets a little crispy and the middle is warm and gooey. Freshly baked cookies beat out cookie dough any day! Also med school has tarnished dough for me; eggs or no eggs, it’s the raw flour that’s most at risk of harbouring bacteria. OMG! Is this a trick question? I’m so glad I happened upon this recipe that offers the best of both worlds so I’m not having to make a rash decision as to which tops the other! I guess a deciding factor for me would have to be the “chip.” I can eat more raw cookie dough if chip digestion is kept to a minimum, however once that chip has been melted into the sheer bliss of a warm cookie, the cookie digestion increases exponentially. Well it’s a toss up! For the purpose of arguments sake…I’m going to lean more towards the cookie dough. Yummm! Oh my gosh! That might be the best cookbook ever!! I love my cookies soft and slightly undercooked…right out of the oven! Both… My sister and I used to bake cookies and things together, and smack the hand of whichever of us wasn’t making the dough, while allowing the fingers to grab.. We’ve taught our kids the same way.. Time to teach the grands! With baked cookies, my big fave is sandwiches, but it HAS to be homemade ice cream, nothing else qualifies! Kisses to little Mr. Handsome! ok, so although I bake a lot of cookies, I don’t enjoy them but cookied dough on the other hand….I truly enjoy. I must confess I’ve even made a single serving at work. yes, I brought the ingredients into work and in a few minutes whipped up scoop of cookie dough to get my fix. The cookie dough is the very best part! I wouldn’t know if I liked baked cookies since the dough never makes it to the oven! I love cookie dough!! But sometimes I like baked cookies. I guess it depends on what I’m looking for in that moment. There is absolutely nothing better then a warm chocolate chip cookie straight out of the oven, ahhh that melted chocolate! While I am attempted to say I like baked cookies better, the amount of raw dough I eat while baking really tells the truth. Warm, soft cookie right out of the oven! It depends on the kind of cookies I’m making, but I usually love to eat the dough- you know, just to “test” it :). I’ll definitely be trying this recipe at my house! i have to go with fresh out of the oven baked cookies! I like mine baked and my husband likes them raw! If it is chocolate chip cookie dough, I would have to say the sough. All others, I can wait until they are done. My birthday cake one year was a request for simply cookie dough – YUM! I get cookie dough ice cream mainly for the dough 😉 Thanks for the opportunity and letting us know about the cookbook. Raw cookie dough, for sure! In college, my girlfriends and I would get together once a week. We would cook dinner together, sit around talking, drinking wine. Someone always brought cookie dough to bake up for dessert, but week after week the dough never made it to the oven- we broke it open and ate it with our fingers, spoons, whatever worked. Wine and cookie dough became a tradition in our circle and at my wedding 3 summers ago, my girlfriends surprised me with cookie dough for us to eat at the reception. Another one of us will get married this summer and I plan to bring along cookie dough for us to dine on! What could be better than cookie dough in a wedding dress?! I am torn between the two. When making cookies I eat a fair amount of the dough and eat the majority of the baked cookies… But I think I would have to go with the dough being the absolute best part. Nothing tastes quite like it. tough one but probably fresh baked cookies that are still warm and gooey…love it! I suppose for me it’s somewhere in between. Sometimes I way love the dough better, but if the dough yields a soft, melt in your mouth baked cookie….I am all over that! Freshly made cookie dough is my favorite, but cookies still warm from the oven with a glass of cold milk are pretty awesome, too. baked cookies are the way to go! It’s a big toss-up… I probably prefer baked. I usually bake mine a little less, though, so the middles are chewy. I love soft cookies! Both–I love to eat the dough then eat the cookies warm!! Nothing better! Sorta both! I like them when they’re warm out of the oven and not quite completely baked. Yummm! YUM!! Cookie dough is the best!! I have always loved my cookie dough raw. I mean, don’t get me wrong…who doesn’t love a fresh baked cookie with a tall, cold, glass of milk… but something comical happens with eating the dough raw. I’m pretty sure for me it reminds me of being a kid and my mom yelling at me to not eat it raw as a slipper comes flying at my head. I duck just in time around a corner, full spoon of dough in hand, running for my life as the “blue boomerang” misses my head by mili-seconds. Now, being all grown up (well, not much taller I admit) I still eat it uncooked with a spoon, leaning against my own kitchen counter and smirk to myself…cause I CAN eat it my way now… all with the familiar “woosh” sound echoing through a long lost (sometimes painful when connection was made) memory. BTW, Mom still yells at me for it. Thankfully, she has lost some of the sharp shooter skills in her right arm…. I like to nibble on cookie dough but the baked cookies are the best! I love Baked Cookies but enjoy snacking on the cookie dough while waiting for the cookies baking in the oven. Baked cookies for sure! I love them when the chocolate is gooey. I like baked cookies, but a lot of the time I am too impatient to wait for the finished product! i don’t think i can pick. it’s a tie! I’m a lover of both cookies and cookie dough. I love the dough but can only eat so much at one sitting before it’s time to move on to a nice warm fresh cookie! Unless you give me oatmeal cookie dough, then maybe I’m more of a cookie dough fan!! I’m not one to turn down either, but if I had to choose only one it’d be cookie dough. Can’t wait to make these, the best of both worlds! Cookie Dough is the bes…. Wait… you can bake the cookie dough??? I like the unbaked cookie dough better! Even brownie and cake batter is better for it is cooked! I personally like baked cookies better. Don’t get me wrong, I LOVE cookie dough, but something about that warm chocolate chip cookie, with the crisp edges and soft middle, ughh, nothing beats it. I like the chocolate chip cookie dough better. It is a bit of rebelliousness factor mixed with the taste pleasure. The dough is sweeter and the sticky texture is such a pleasure. Mixing the 2 would be a great idea. I just may have to make ice cream with cookie pieces and dough together now. Oooooh!